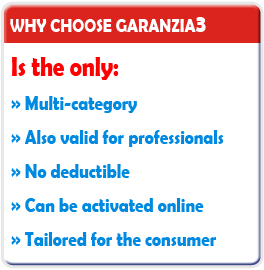 GARANZIA3 is the technical assistance service offering the producer’s warranty period prosecution through the repair and/or replacement of the product or, if it is impossible to proceed with the repair and/or replacement, GARANZIA3 will refund the purchased price reduced by a percentage related to the age of the product. In order to activate Garanzia3 the customer can log on the website www.warranty3.co.uk or fill the extension’s certificate in all its gaps, sending it with a copy of the purchase document and, if present, the original warranty issued by the manufacturer, via registered mail with return receipt to the address stated on the certificate, within and no later than one year from the purchase date of the product. Activating Garanzia3 Business Company S.p.A. will guarantee the customer the prosecution of the warranty offered by the producer, through the repair and / or replacement, within the limits of the general conditions below. GARANZIA3 offers the prosecution of the producer’s warranty period for 3 years (or for a shorter period of time in case of the original manufacturer’s warranty period exceeds 2 years) and will have the effect shown below. The assistance service offered by GARANZIA3 will not have a duration exceeding 60 month from the purchase date of the product to guarantee. b) In the case of a professional buyer, GARANZIA3 will be activated on the first day following the expiration of the manufacturer’s warranty, usually 1 year. The GARANZIA3 assistance service will be delivered following the same terms and conditions described in the original warranty certificate issued by the manufacturer and valid at the time of the product purchase. In case a warranty certificate should not be supplied by the producer, GARANZIA3 will refer to the warranty conditions on the website of the producer himself. The repair for each intervention, over the duration of this extension, will not cost more than what stated on this certificate, equivalent to 500,00 / 1000,00 / 2000,00 / 5000,00 euro (depending on the chosed certificate). Any damages or faults caused, in any case, by negligence or fraud of the customer or due to the normal wear of the components, that are excluded from the original manufacturer’s warranty are also excluded from the warranty extension. In the event that this last possibility occurs, Business Company S.p.A. will immediately communicate an estimate of expense for the repair of the product. No deductible will be charged to the customer for the repair of the product. During the legal guarantee period, Business Company S.p.A. will offer customers information regarding the proper use of it. From the first day after the legal guarantee expiration the customer will have the right to repair the product with no additional cost, using GARANZIA3. In the event that the product cannot be repaired, GARANZIA3Warranty3 will propose its replacement or refund of the purchase value of the product, by reducing an annual rate of 10% of the purchase value. 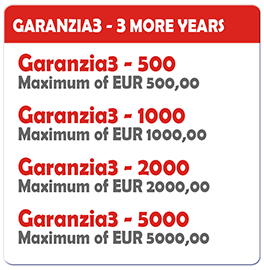 Upon device failure, after the end of the legal guarantee, the customer must log on the website www.warranty3.co.uk or send an e-mail to assistenza@garanzia3.it, or call the toll free number 800090737 (from Mon to Fri from 10:00 to 17:00), to communicate its personal details and the details of the GARANZIA 3 certificate; the customer service will verify the correctness and communicate to the customer the procedures and terms to be followed for the product repair. GARANZIA3 COVER is the technical assistance service offering a single repair only in case of accidental damage, in the first 12 months from the purchase date of the product; if it is impossible to proceed with the repair, Garanzia3 will refund the purchased price of the product reduced by 30%. In case of damage not considered as accidental, like: defects recognized in the legal guarantee, damage to equipment, damage to the aesthetic parts that do not affect the functionality of the product, damage caused by willful misconduct or negligence of the Client, software damage, corrosion damage and / or oxidation, damage from improper use as provided for by producer, supplies, and damage due to wear, Business Company S.p.A. will communicate to the customer that it will not be possible use the GARANZIA3 COVER services and redeliver the product not repaired. GARANZIA3 COVER must be activated on the website www.warranty3.co.uk no later than 7 (seven) days from the purchase date of the product. Activating GARANZIA3 COVER, Business Company S.p.A. will deliver a technical support service to the Customer for a single repair or refund of the product, following the limits indicated below. – GARANZIA3 COVER shall begin on the purchase date of the product, for a maximum of twelve (12) months, as shown on the purchase document and / or until the supply of a single repair or refund of the product. – To use the GARANZIA3 COVER services the certificate must be activated within 7 (seven) days from the purchase date of the product. 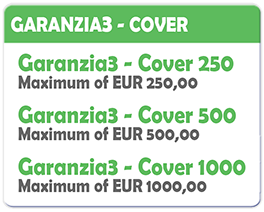 The GARANZIA3 COVER service will be delivered following the same way and terms described in the original warranty certificate issued by the manufacturer and valid at the time of the product purchase; repair or refund will be possible for a single intervention over the duration of this extension and will not cost more than what stated on this certificate, equivalent to 250,00/ 500,00 / 1000,00 (depending on the chosed certificate). Are excluded from service all damages and failures not considered accidental already indicated above. From the first day after the activation of GARANZIA3 COVER, the Customer, in case of accidental damage, will have the right to repair the product with no additional cost. In the event that the product cannot be repaired, GARANZIA3 will propose reimbursement of the purchase price reduced by 30%. The customer must log on the website www.warranty3.co.uk or send an e-mail to assistenza@garanzia3.it, or call the toll free number 800090737, to communicate its personal details and the details of the GARANZIA3 COVER certificate; the customer service will verify the correctness and communicate to the customer the procedures and terms to be followed for the product repair.